A classic made vegetarian without losing any of the delicious flavor or heartiness of the original dish. This Chickenless Chicken Style Vegetarian Stew sort of made us think, "Yeah sure!" until we made it. It is so delicious it is hard to believe there is no meat in it at all! It quickly became one of our favorites. So even if it isn't quite that time of year when you think a hearty bowl of stew would hit the spot, trust me, this one will hit the spot! Here is a little tip our friend Juli sent along with the recipe..."The soup is the only non-vegan ingredient, I have a friend who said she makes it without the soup, just add a little extra water and bouillon and then thickens the gravy with flour." So grab some cream of something soup and make this great chicken stew recipe. We use cream of celery usually, although it is equally as good with cream of mushroom. Chickenless Chicken Stew? Yes? But it sure doesn't lack flavor. It's a terrific meal in minutes. Saute onion and celery in oil until starting to get tender. Add carrots and saute 4 or 5 minutes more. 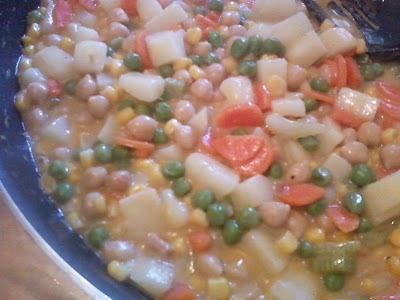 Add water, chicken cubes, soup, corn, peas, beans, potatoes, and seasonings. Simmer until potatoes are tender. Combine flour and enough water to make a thin paste. Stir slowly into hot stew, stir to combine and cook until thick.